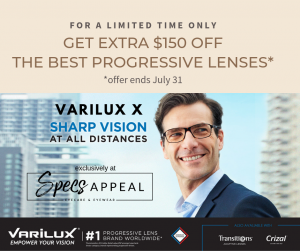 Get an extra $150 off Varilux X lenses! For a limited time, get one of the best Progressive lenses for an extra $150 off. Get sharp vision at all distances, seamlessly capture every detail within arms reach and beyond. You no longer need to move your head to find the sweet spot! Exclusive offer at Specs Appeal in Decatur only, offer expires July 31. Give a friend $10! Make sure you tell your friend to mention who referred them so that they get a $10 credit good towards glasses or exam, and you get a $10 credit for every referral. We accept a wide range of vision insurance plans, including VSP, Eyemed, & Davis Vision to name a few. As Vision Source Specialists, we offer a variety of discounts on glasses, sunglasses and contact lenses. We also offer additional discounts for Private Pay, AAA, AARP, and Military. Contact us for further details on the Vision Source Specialists current promotions.